This year’s Lyman Car & Craft Show will be held July 9, from 8 a.m. to 4 p.m. The show supports the Lyman Park and Cemetery, properties that are not tax-supported and depend on donations for maintenance and improvements. All proceeds from the show are donated to the park and cemetery. This year we hope to break records with attendance of autos and people. We have 25 auto/truck classes. Our awards are unique each year. Local artist Sheila Torgeson paints a new picture each year for us to use as the artwork for our plaques and T-shirts. This year the picture features three autos and two trucks, with the Skagit River and mountains in the background. We have a limited quantity of T-shirts for $20 each, and we also have black-and-white shirts, plus a few tank tops. Shirts are on sale now at Lyman businesses. The last day to purchase a shirt will be the day of the show. Sonja Haigh of Lyman sold sponsor banners to local businesses; the banners are hanging in town. Local businesses purchased advertisement on the banners, some with their logo and others with a picture of their favorite car. If anyone wants to purchase a sponsor banner for next year’s show, contact Sonja. The response to the banners has been huge and we are limited on the number we can hang in town. Sonja has also been busy signing up craft booths to local artists, as well as artists from other counties. With the help of Best Buy in Burlington, we are selling raffle tickets for a Samsung 40” 1080p TV. Tickets are $5 each and only 500 will be sold. We also have our general raffle with more than 50 prizes and a silent auction with some amazing items donated by local businesses. Papa Murphy’s in Sedro-Woolley has generously donated its pizza again this year. Gail Ganga and her crew will set up their portable ovens and bake the pizza at the show, selling it by the slice. Cascade Mercantile of Lyman will sell hot dogs and hamburgers; for a dollar extra you can add chili to your order. All proceeds will go to the Lyman Park and Cemetery Fund. Last year we had more than 30 craft and specialty booths. Our craft area includes everything from paintings to woodworking, and from jewelry to spray-on tattoos and fresh-baked breads. Java Zone of Concrete will have a booth in our food area too. Speaking of food, feel free to drop off a nonperishable item or a cash donation at the Shepherd’s Heart Food Bank booth. Another place to visit is the Lyman Tavern. Mayor and owner Debra Heinzman will serve breakfast starting at 8 a.m. The food is awesome, especially the biscuits and gravy. The response to this year’s show has been very strong. 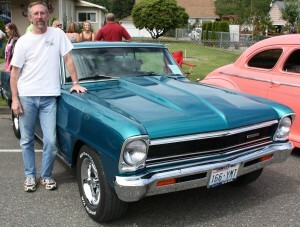 Each year we grow; word on the street is that Lyman has one of the best car shows in Skagit County. For more information, contact Nancy Trythall at 360.855.1280 or Sonja Haigh at 360.661.3954. Rick Lemley from Sedro-Woolley brought his 1966 Chevy Nova to last year’s Lyman Car & Craft Show. This year’s event is slated for July 9, from 8 a.m. to 4 p.m., and will include a raffle, tasty food, a craft area with dozens of booths, and, of course, plenty of cars.